View our diamond necklaces here. There are times when the gift of a diamond ring may seem inappropriate. At these times a diamond pendant can be a perfect alternative. Diamond rings come with many different connotations and the recipient could get mislead by its implications. Diamond pendants are just as beautiful and will not cause such confusion. A diamond pendant is a great gift for any occasion. No matter if it is a Valentine's Day gift or a birthday gift your recipient will be thrilled with the gift of a diamond pendant. If you are not sure what kind of diamond pendant to get for your loved one you might want to consider taking a peek at their jewelry box. You can tell a lot about a person by what you find in their jewelry box. If you look and see many similar types of jewelry, you may want to choose something similar. 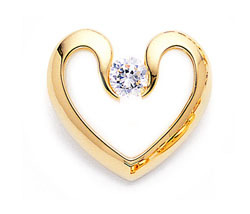 For instance, if all you see is yellow gold then you should definitely choose a yellow gold diamond pendant. This way your recipient will be able to wear their pendant with all of their other jewelry. If you were to get a white gold diamond pendant it would not match and would most likely get worn less. If all she has is yellow gold this could be because that is all she likes. Shopping for diamond pendants is something that can be done entirely online. This is something that you may not have done before but once you do you will never go back to shopping the old-fashioned way. By shopping online you will have access to thousands of different diamond pendants, pendants that you could never have found the old-fashioned way. You will also be able to find diamond pendants in all different price ranges. This is very important because most people do not have the wealth to be able to only buy the most expensive diamond pendants. Being able to compare prices will assure you of getting the best possible pendant for your money and make a good impression on your loved one. Diamond pendants are the perfect gift for everyone that you love. You can give diamond pendants to your children, your mother or even good friends. Diamond pendants can be made entirely of diamonds or they can have diamonds as accents. Diamond pendants with diamond accents are generally made with other gorgeous stones as well. Stones like topaz, amethyst or citrine are very common and beautiful. These colorful diamond pendants are also much less money than a pendant that is made of just diamonds. Diamonds are very expensive and if you have a limited budget you should consider a diamond pendant that contains other stones as well. The beauty is equal, just a little more colorful.